The 'Tigger mailbox' at the heart of a three-year legal battle still stands in front of the Webers' home in Langhorne, Bucks County. 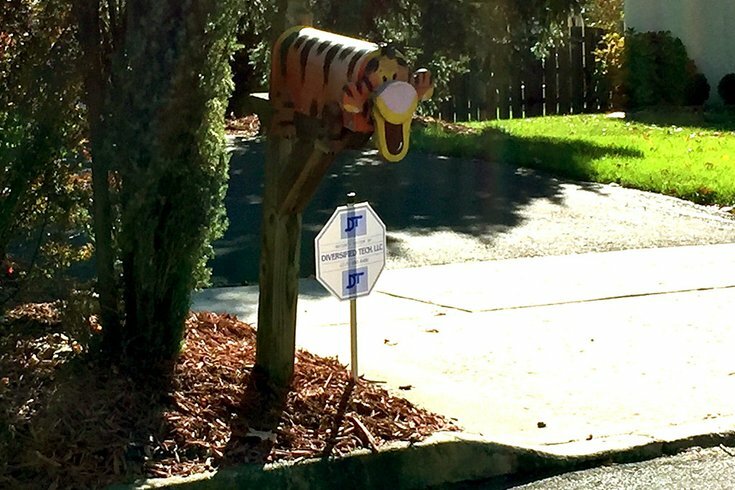 The Tigger mailbox must come down. A Bucks County family that engaged in a three-year legal fight with its homeowners' association learned Monday that the mailbox, a gift for their young daughter, would not be saved by a group of state judges. In the case, which landed on appeal in the Commonwealth Court of Pennsylvania, a three-judge panel affirmed that Bucks County Court of Common Pleas Judge Robert P. Mellon properly determined that the Laurel Oaks Homeowners' Association had authority to require Jonathan and Abby Weber to remove the mailbox of the Disney character because it violated the association's guidelines. The mailbox has stood outside the Webers' home on Fawnhill Drive in Langhorne for more than five years. Shortly after it was installed, the homeowners' association (HOA) decided the mailbox had to come down because the family never applied to Laurel Oaks for the "change or addition" to its lot. The family appealed, it was denied and the dispute jumped into the courts in 2014. Essentially, the Commonwealth Court panel agreed that the mailbox was a "structure" that required previous approval by the HOA and that it did not conform to the "architectural standards of the community." The judges also agreed that the Webers had no right to a new trial. The memorandum opinion, written by Judge Robert Simpson, starts "In this over-litigated case..." and ends, in part, "This litigation would have benefited from more adult attention early on...."
Jonathan Weber did not immediately respond to a request for comment. It was not immediately known if the Webers would appeal the decision. If not, it would appear the the family has 30 days to remove the Tigger mailbox from the curb in front of their home. That was how long the family was given to comply with HOA guidelines in the original trial court decision.